Prime Minister Moses Nagamootoo has labelled heckling of President David Granger by placard-bearing parliamentarians of the opposition People’s Progressive Party a brand of terrorism and hooliganism, but Opposition Leader, Bharrat Jagdeo has justified the protest action. “I think he [President David Granger] battled on today as a real soldier inspite of an unusual and unprecedented outburst of political hooliganism in the House, I think Mr. Jagdeo has attempted to turn the National Assembly into an arena of domestic terrorism thinking he could intimidate the President of the Republic of Guyana from delivering his charge to the National Assembly”, Nagamoooto was quoted by government’s Department of Information as saying. 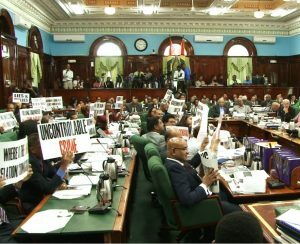 The People’s Progressive Party’s (PPP) lawmakers did not boycott the sitting as had been expected, but instead opted to remain in their seats and about one minute into the President’s speech, they whipped out placards and loudly chanted slogans while the Guyanese leader was addressing the House at the end of its two-month recess. The President, despite the uproar delivered his speech, where he highlighted measures implemented by the Government over the years and outlined plans or further advancement of the economy, as the Administration work towards ensuring the “good life” for all Guyanese. Prime Minister Moses Nagamootoo, in a special interview following the President’s address expressed dissatisfaction with the Opposition’s behaviour in the National Assembly, noting that the Opposition Leader, Bharrat Jagdeo has brought himself down to a lower level. The Opposition, according to several ministers of Government, not only displayed a high level of disrespect for the Head of State but also a negative image as representatives of the people and further did so in the presence of the diplomatic community. As the President addressed the House. Speaker of the National Assembly, Dr. Barton Scotland tapped his gavel several times to restore order, but the Opposition refused to heed his appeal. The next sitting of the House is scheduled for November 17, 2017, when Minister of Finance, Winston Jordan is expected to present the 2018 National Budget.